When we moved into our house two years ago, part of the agreement was that the previous owners would leave the patio furniture. After two winters outside, I decided this spring to refinish this set. I wasn't really sure what that would entail, but I knew from my little wrought iron set (which I blogged about here) that two coats of polyurethane weren't going to cut it with this set. The general rule seems to be to wash and apply teak oil to the set. Unfortunately this set has already been coated with polyurethane that was peeling and cracked and just about impossible to sand away. I have yet to finish the dining chairs, but for now, they're clean and I'll probably just paint them. I will never have the time or patience to do with them what is really necessary. Here is my official "Before" picture. The weird markings on the chair are from old layers of poly. It's almost charming. Here are most of the pieces after power washing. In total there are 4 dining chairs, two lounge chairs, and a table. The next step was to sand and sand and sand and sand......The polyurethane was really rubbery and weird to get off. I focussed on the table top, edges, legs, and the two lounge chairs. The dining chairs had too many curved surfaces and I just don't have the stamina or hand strength to sand the polyurethane off by hand. The final step for the two lounge chairs and the table was 8 coats of spar varnish. I did this in May and it has been a very HOT summer...but also relatively wet. So far it has held up perfectly, but I will be covering these pieces in the winter. I attempted to use teak oil on one of the chairs. It just looks bad because of all the polyurethane that is still left on them. Eventually I'll paint them, but I just haven't had the time and it's been way too hot outside this summer to even enjoy any of this. The table is really beautiful! The next step was rehabing the cushions on the lounge chairs. I bought an outdoor material from Fabric.com that I liked and wound up just using the old cushions because foam is SUPER expensive and all of these pieces soaked up a lot of money in spar varnish Again, I used 8 coats of varnish on all the areas that might hold water, like the table top and under the lazy susan. I only used 4 coats for the under side of the table and chairs. Still, it adds up. I didn't bother with zippers because I just don't see myself ever taking these off to wash them. The fabric was $5 a yard and I used old foam. If something happens to them, then it will be time to just start fresh. Plus, zipper cost money, and by this point, I was done spending money LOL It was starting to turn into a hot summer. I started this over Memorial day weekend and finished the cushions around the fourth of July. I did remove the old covers prior to putting the new ones on. Pattern matching was perhaps my biggest concern on these, and one of the larger challenges, especially when I was also trying to avoid waste. I do have enough material left over to make some pillows or a table runner or something. I didn't do as good of a job documenting this process as I did with the 2015 shirt. I wound up using a few of the drawings I'd done the year before. The guitar, mountain dulcimer, and violin are essentially derived from the same original sketches. Occasionally being a digital file hoarder pays off. I did have to do most of this design from scratch. I had several ideas for this t-shirt, but this one seemed most likely to get executed. Again, I did a real bang up job of documenting this project (note my sarcasm). Essentially I followed a similar process to my 2015 shirt. I used scanned sketches in photoshop to arrange my composition. Then I printed them out (fairly large this time) and used a light table and pen to create clean, uniform linework that matched in style and consistency. I didn't want this design to be as sketchy looking as the 2015 shirt, so the media I used was not quite the same. Once I had my linework, I knew this would be a two color design and that I wanted all of the drawings to be one color, and the border and text to be the second color. To the left is the initial composition for placement. This is what I used for tracing with the light table. Above is the finished two color screen printing design. Personally, I happen to prefer 1 and two color t-shirts, but I included a full color version of this design just for poops and giggles. It certainly had an appeal to it. Turned out the ODPC loved the full color version and chose to go with a full color t-shirt. Well...I'm so behind on this but I will do a separate post for the 2016 shirts. I really wanted to do a design that would appeal to a LOT of different people, not just hammered dulcimer players. I also wanted it to convey an old-timey festival sort of vibe. The idea was for the shirt to work as both desirable merchandise AND advertising for future festivals. I started off with a crap ton of drawings. Once all was said and done, several people at the festival complained that I hadn't included an autoharp, or a hurdy-gurdy, or a concertina. Nothing against those instruments, but I limited myself to one P.I.T.A. instrument to draw and I had to include a hammered dulcimer, so the quota had been met before I even started. Sketching and finishing these line drawings took kind of a while. First I scanned all of the drawings. I brought each individual element into Photoshop as black and white linework and spent some time arranging all of the pieces and masking out the instruments so that the composition was balanced. The instruments are certainly not proportionately scaled to one another, but they aren't so disproportionate that you can't tell the difference between a guitar and the 'ukulele, or the bass and the fiddle. Once this was done, I printed it out and used a light table to re-draw everything so that I'd have uniform line-weights throughout the entire design. I knew I'd want this to be a two color design, so I separated the colors onto two different pieces of paper before scanning them in. It might seem odd that these are so small, but unlike most projects, I wanted these lines to actually be thicker than I was drawing them. I always worry with screen printing that my linework will be too fine...so I figured I was better safe than sorry. Apparently the t-shirt sales were quite a success. After my last post, one of my neighbors connected me with someone who was moving and needing to unload some dressers that were in mild states of disrepair. As it turned out, the dressers were HUGE and I thought, "well...maybe I can work on them and sell them." Coincidentally, as it also turned out, the dressers were HUGE and contained such amazing storage that I could not bring myself to part with them. I had to move a bunch of other furniture (most of which wound up in my garage) to make space for these beauties, but I don't regret it one bit! These pieces got dropped in my garage right before I was heading on a road trip, so I quickly got started with repairs and left the glue to dry. The veneer was totally coming off the dresser and a leg had broken on the tall-boy. I didn't take very good "before" photos...but you can almost see how damaged the dresser top was in this photo. That's not dust. Once I got back into town, the pressure was on to get these pieces finished since they were preventing me from parking my car in the garage. After cleaning and sanding, the wood on top of the dresser was really pretty, but there was some serious damage from ink. That combined with the warping from the whole veneer peeling off meant that the naked wood would never really look quite right. Total bummer. I needed to paint it. This pic doesn't really show the issue...but if I really wanted to have an exposed wood top, I'd have needed to replace the whole top, which I did consider! It would have taken more money, knowledge, and elbow-grease than I currently possess. I started out with Annie Sloan chalk paint in Paris Grey. Ew. Just...ew. This does nothing for me...and I'm not sure how I even got the whole thing painted before I realized how horrible it was. I think this was when I was still thinking I would be selling this piece, so I wanted to go with a color that was more neutral. The charcoal colored top was not doing anything for me either, so it was back to the drawing board! Yeah. Double ew. Lavender didn't work either. But hello Florence Teal! We have a winner! I think I mixed the Florence chalk paint with some of my charcoal black color and a little bit of whatever that horrible lavender mixture was. That's what I used on the top of this piece. It's darker and less saturated than the rest of the piece. This was also my first semi-success with dark wax. Dark wax is still pretty scary to me, but I distressed this, and with the dark wax, it's really pretty nice. It isn't perfect, but I love it. For the tall boy, I REALLY wanted to paint it yellow. I still thought maybe I'd sell it...but I just couldn't. I wound up going with Annie Sloan's Provence blue. It's not as bold as Florence, but not as stale as Duck Egg blue. For this piece, the top of it was still in perfect condition. The wood grain wasn't nearly as pretty, but it was refinishable. I was nervous about tipping this piece up after repairing the broken leg, but I managed to get the whole thing finished, moved inside, and (with some help) eventually upstairs without braking the foot off...so it's holding up pretty well. I still feel like my dark waxing isn't the greatest...but I like this piece as well. I'm not opposed to painting it yellow some day. This works for now. When we bought our couch, I saw all these cool ottomans, but they are like $500 and that's bogus. So I decided to make one myself. This was a learning process and I probably still spent about $200 on this. It is by far my most expensive project, but it turned out really cool and I still saved a lot of money. Unfortunately I did a $#8! job of documenting this project with photos, but I'll explain what I did. I picked up this weird coffee table. The seller was practically my neighbor. It was HEAVY! It's made of MDF or something, laminated with some fake veneer and was a solid box on all 4 sides. The bottom was also the same material. I knocked it off with a sledge hammer before I took any pics, so I apologize. It smelled kinda like cat pee, so I was glad to be rid of that part. Once I took the base off it, it was only 7" high, so I began with the math of trying to add height to it. I started with little feet things I got at home depot. I got little brackets that I installed and then was able to screw on the feet. Then I drilled holes in the feet and added castor wheels. This thing was gonna be heavy and I wanted it to be easy to move. I got 5" foam for the top and was still going to be a little short on height, so I went and picked up some 3' long boards from Menards. I made a frame of 3" wide boards, then I put 3 1'X3' boards across the top of that. It added just enough height to make this into an ottoman. From here, I began the upholstery. I picked up this muted chevron decor fabric on sale. The colors worked really well with my new couch. Since the couch is grey, I wanted to tie in some yellow, warm beige colors, and a little grey just to warm up the room. I didn't want a real bold chevron print with hard edges though...but I didn't want anything flowery and loose either. The problem is, the ottoman, after adding all the height, was too tall to wrap this fabric around. I wound up making 4 large squares. I rotated each one to make a pinwheel pattern with the fabric and then sewed them up to make one huge square that would wrap around the entire ottoman. You will see the pinwheel effect later. I also got one of those little button maker thingies so I was able to make a button for the center tuft. I used spray glue of some sort to glue the foam onto the top of the ottoman. Then I wrapped the entire thing in batting and stapled that down underneath. I took a drill and drilled a hole right in the center of the top. Then I flipped it over and cut a big jagged hole in the bottom. This was for the tufted button. I installed that with a giant upholstery needle and stapled the crap out of it to secure it in place. It seemed unorthodox, but that's how everyone does it, I guess. Once the button was secure and I was certain the fabric was centered, I started stapling the fabric around the whole thing. I added a basket tray for placing things on the ottoman. It also protects my fancy schmancy button that I'd hate to see ripped off. I've been wanting a larger table and chairs for a while now, but didn't want anything huge. I spotted this table for $80 and picked it up ASAP. Again, I did not get any real "before" photo of the table. This photo is after sanding. Just imagine the whole thing is that dated orangey color. Upon sanding, I fell in love with the wood. But I also knew the guy I bought it from had put about 5 coats of Polyurethane on it and I'd never be able to get it off the entire table. So I committed to rehab-ing the top and painting the bottom. Just getting the polyurethane out of the little groove end was a huge pain. For the top, I think I must have tried 4 or 5 different stains and none of them worked. The "Pickling" stain I got was a joke. I wound up finding something called "Driftwood Stain" that turned out to be a winner. knew when I started this that I wanted to have a bench on one side of the table. I scoured craigslist for a good bench and found something PERFECT. Of course it had chickens painted all over it...but ya' know. I stripped those suckers off and was relieved to find that the wood matched my table top! I went ahead and stained both with the driftwood stain and painted and distressed the bench. I did a few coats of Polycrylic on the table and bench. It does not turn yellow over time, like polyurethane. I found 4 tufted side chairs on Wayfair in the clearance section. They turned out to be the most expensive component of this set, but it's just what I was looking for. The table is not too large, but can seat 6 people without feeling too cramped. This Thomasville dresser has followed me around for the last 10 years, living in one garage after another. I painted it white about 15 years ago with high gloss latex paint. At the time I was painting over black, which my mom had done years earlier. She'd painted over green, which was the original color when my grandmother purchased the piece. I've always liked this for it's size and lovely shape. When I painted it last, I replaced the hardware with brushed chrome and puttied and re-drilled holes for the drawer-pulls. I don't know what became of the original hardware, but I'm sure parts were missing and it was beyond redemption. This was my first attempt at full rehab and it was a real learning process. First I got to work stripping the many layers of paint off. This was no small task, but once I got into it, I was glad I decided to do it. It took a number of coats of stripper to get the paint off. Then started my attempt to salvage the top. As you can see, the wood was pretty gross. The dark spots are cat pee from probably 20 years ago...maybe more. If you ever wanted to know what 20 year old cat pee smells like, I can tell you. It smells just like regular cat pee. I sanded and washed and bleached and sanded some more and try as I might, NOTHING would get rid of that smell. The only thing that I could do was shellac the entire thing. I'd invested a LOT of time by this point so Shellac I did! I painted a few coats of shellac on the top and did spray shellac inside the drawers, on the bottom, and inside the whole chest. Miracle of miracles, it worked! No more smell! The wood was not very attractive so I tried a pickling stain on it. I wasn't impressed. Initially I wanted to paint this piece a coral color. Despite being warned that coral is nearly impossible to get right, I went for it. The lady at the Annie Sloan retailer suggested a mixture of Barcelona Orange, Old White, and some taupe color. I painted the feet silver and left it like this for a while. Then I realized this is obnoxious and repainted the whole thing. I did not document the latter. I also did some wood repair on the feet. You can see that the foot in front was damaged so I sawed off part of one of the rear feet and glued it to the front. It took some wood putty and sanding to make it right, but I'm glad I took the time. For this, I used Annie Sloan Old White. I also mixed Florence teal color with white to get the lighter teal blue. I have no "before" photos of this piece. It was all cream color with gold leaf details and speckly bits throughout. I fell in love with this table when I first saw it at my mother-in-law's house. Eventually she stopped using it and put it in her basement. After a couple years, she asked me if I'd like it. Um, yes please! Maybe some day I'll replace the veneer, but till then, the wood was still nice enough for me to leave it exposed. The rest of the table wasn't as nice as the top veneer, so I just painted the entire thing in Annie Sloan Old Ochre and did some distressing. Again, I avoided the dark wax because it still scares me. I stained the top with a charcoal stain. It's subtle, but cooled down the color. This piece is still a favorite of mine. I just love the shape. It makes a great table for behind the couch and sits nicely between my two extra dining chairs. I'd been looking for a buffet for weeks when I found this little girls dresser for $79. It was exactly the dimensions I was looking for and had a good body. I was really hoping for a different style buffet, but I couldn't find any that were the right dimensions, and even used, I couldn't find a real buffet in my price range. So this worked. For the re-do, I was limited to painting this piece. It is not solid wood. I used three Annie Sloan paints. French Linen for the body. Old Ochre for the drawers. Old White for the trim. I mixed French Linen and Old White to get the light grey I used to trim the top. I just did a clear wax and decided not to do any distressing since the piece is not actually wood. I didn't want the compressed board to show through. I also have not gotten the hang of dark waxes, so I opted for a more "clean" style. I'm still open to replacing the hardware. Hardware is expensive and I don't mind what's on there right now. When we moved into out new house, I was disappointed to find that our bedroom was not wide enough to accommodate me Queen Anne end tables that I'd been using as night stands. So, I went in search of a couple narrow tables with little drawers. I found these for $30. They are hideous, but made from solid wood and are good, solid pieces of furniture. Perhaps in the future, I will try to bang these into shape and sand down past all the damage in the wood, but until then, I slapped a coat of paint on these babies and replaced the hardware. Note: Drop Leaf Tables are a real pain to paint. I'd have been better off salvaging the tops and leaving the raw wood. I picked up these chairs because I thought they were comfortable and I like chairs that sit low to the ground. All I really did was paint them and put new cushions on. I'm not digging the cushions...but until I find something better, they are an improvement. I found this chair on the side of the road. The asking price was $30 so I called the number and said I had $20 and could pick up the chair right then. Sold! The chair was in good shape really. It just needed a coat of paint and a cushion. I used white and metallic silver spray paint for this project. I Painted the silver first, then once it was dry, I taped it off with painters tape and a few black garbage bags. I painted the rest white. This was a very simply project. I finished it off by adding a couple pillows I got from AT HOME. I used a big decorative pillow for the seat instead of a regular seat cushion. They are much cheaper. My sister picked up a little drop-leaf end table for $2 from a garage sale and gave it to me. The table was plain, and solid wood. I needed to tighten the legs and leafs before I got started. Then I sanded the top to see if I could salvage it. The wood was very damaged. Did I take any photos of this process? Of course not. I wound up painting it black with a mixture of spray paint and a can of black semi-gloss. I used the spray paint on the legs and undersides of the leafs because it was easier than trying to paint them with a brush. I figured, it's a $2 table and I didn't need it to be perfect. Commence Chevron stripes. They were a pain. I started by finding the center of the table and making marks from the center outward. The chalk marks indicated where I should start and stop taping. Once I'd finished taping, I began painting in the stripes. I used a metallic silver by Martha Stewart. I don't recommend this because it wound up looking like duck tape. But it's still cool and I like it. It took about 3 or 4 coats. I am now using this table as a printer table in my office and it's perfect. Once I removed the tape, I found it had bled a bit in the acute angle areas. I had to go in with a small brush and touch up the black. I did 4 or 5 coats of polycrylic on this piece to seal up the top so it doesn't chip off. I've had this red end table forever. It was my grandmothers and is really meant to be covered with a cloth...because it's ugly. But I decided to see what I could accomplish with it since. Originally I wanted to do a clock face on the top of the table. I can't remember why I didn't. I decided to to a compass instead. The first thing I did was strip the paint off the top. I decided to just sand it off, rather than use stripper. The latex paint was real rubbery and clogged up the sandpaper pretty quick. It was still easier than stripping it. I opted to just paint over the rest of the table. I skipped a few steps in my photos. I wound up painting the top with a black chalk paint from Home Depot. I think the brand is called "Home Decor" or something like that. I actually like the brand and it's way cheaper than Annie Sloan. After that, I used Annie Sloan "Old Ochre" and just did a dry brush technique over the black. It turned out kinda cool. For the rest of the table I used Annie Sloan "Duck Egg Blue". I distressed it a lot so that the red would show through. The overall effect is quite nautical...which worked with the compass motif. To do the compass, I just worked with what I had on hand, which wasn't a whole lot. I'm sure there are better ways of doing this, but I didn't feel like spending any money on anything I didn't already have. I did a transfer method with charcoal. First I printed out a compass image. I used Illustrator to place the image on 9 separate artboards. This way it printed out on 8.5"X11" paper. The image needed to be a mirror image in order for my technique to work. My black ink was running out so this printed brown. That worked out rather well because it allowed me to see what I was doing when I moved onto the next step. I used black charcoal and just drew right over the image. It wasn't necessary to fill in all the dark areas since I could just do that with paint on the actual table. I started my transfer with the center piece. I places it right in the middle of the table and taped it face down. Then I used the back end of a screw driver and just scribbled all over the whole sheet to transfer the charcoal. From there, I placed each sheet down and did the same thing, being careful to match up the lines. You can see the result is a little sketchy, but cool. It rubbed off easily, so I obviously needed to go over the whole thing with black paint. I did the little tick marks and numbers by hand. I messed up here and there, but it's ok. I dressed it up with a couple nautical-ish items....A coral and an hourglass of sand. For decorating my office, I decided to do a cool technique with high gloss paint and flat paint. I purchased the same color in both textures and painted the entire wall with flat yellow. Then I got to work taping off the diamond pattern. I didn't have any stencils or anything, so I used a 15" square canvas print I had and a mechanical pencil. I started out with a level to make sure when I put the canvas on the wall, it was not crooked. Then I marked a small dot at each corner. After a few diamonds, I didn't need the level anymore because I could just line the canvas up with the dots I'd already made. Then I taped off the diamonds and used the high gloss paint to fill in a checker board pattern. After that, I just painted the rest of the room a bright white. For the rest of the room, I bought IKEA table tops and some square shelves. I got REALLY lucky with the size. The two shelves and two table tops just barely fit....and it was a tight squeeze. But it almost looks like it's custom fit! All in all, I'm really pleased with this office set up. My husband and I each have out own cubicle and there is plenty of storage too! Simple. Sand and Polyurethane the wood. Cleaned the metal with steel wool, taped off the wood, and painted. Photographing these two sisters was almost like going back in time to my childhood. Madison and Sophia were so much like my sister and I. I always wondered why there weren't many photos of the two of us together. Well, now I know! The combination of dry winter static and two girls who were pulling each other's hair the minute they were in an arms reach made this a shoot both challenging and fun. This is the coldest, snowiest winter I have ever experienced, and February 15th did not disappoint. It was just bitter outside. My cabin fever is what motivated me to give this session a light and airy feel. I just got in the mail my copies of "Folk Songs Across Illinois #5". I recorded on this album back in June. Bucky Halker, a music historian who helps run Company of Folk, contacted me in May to ask if I'd want to be a part of this project and it sounded fun. In 2013 I was awarded a Master/Apprentice grant through the Illinois Arts Council, which is what put me in the loop of the Company of Folk. This is the 5th edition of a series that have documented scores of Illinois folk musicians. My understanding is that the music will be available for sale, but the main distribution is with museums, historical societies, libraries, and that sort of thing. I've really enjoyed listening to the CD. The musicians are all Chicago area musicians who play cultural folk music, and anyone who's been to this area knows how incredibly diverse the cultures of Chicago are. This particular album contains hammered dulcimer, santoor, and cimbalom, as well as a whole bunch of other ethnic instruments from various cultures. For the most part, it sounds like a bunch of world music...the cool part is that they are all Chicago folks. I think my track is one of the most "American" sounding tunes on the whole disc. I recorded this track in Morton Grove at Steve Yates' Studio. Bucky recorded a guitar track and Al Ehrich played Bass. I was asked to play something folksy, and I'd worked on this medley a bit during my studio-recording study at Waubonsee. The pieces are a personal favorite, Tomahawk, which I learned from Paul Van Arsdale in 2008, and Cherokee Shuffle, a traditional tune often played on the dulcimer. For the heck of it, I'm posting two tracks. One is the actual recording, the other was recorded at an earlier date in the recording studio at Waubonsee. I think it's interesting to compare the two sounds. The recording on the left is track on the CD for Company of Folk, which was recorded in in early June. The guys were used to playing Cherokee Shuffle with an extra B minor in the B part, so that's how we did it. It really messed me up at the time, but I think it sounds kinda cool now. I recorded it on my Dusty Strings D650 with solid wood hammers covered with several layers of masking tape. There was one omni-directional mic positioned above the dulcimer, towards the top. I'm slightly annoyed with a few notes, but this was only our second take and since I'm prone to making mistakes when the pressure's on, we decided to quit a winner. This track was recorded live by the three of us in one take. The recording on the right is the one I recorded in the studio at the college. My friend Skip Sittig played guitar and bass for me and this is what we based the final recording on. 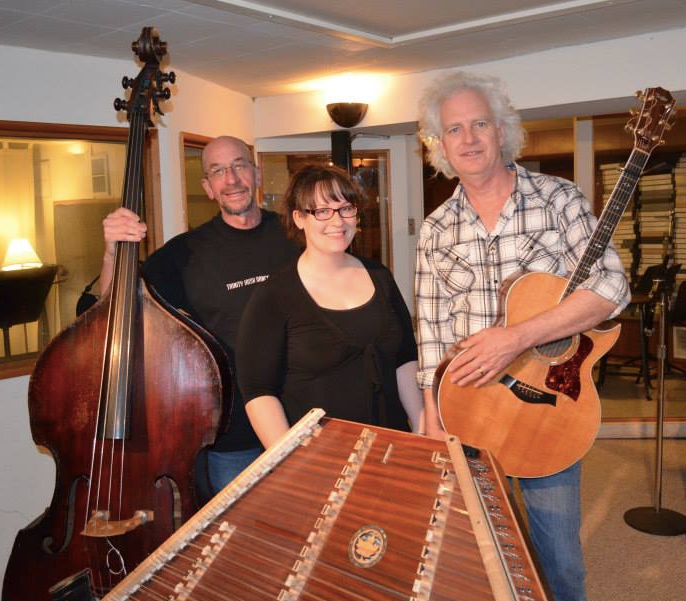 It was recorded in early May on my Bill Robinson dulcimer. This instrument has a floating soundboard and is tuned very differently on the bass bridge. It also has three strings per course, whereas the D650 has 2 strings per course. I used "floppy" hammers made from corset stays, which is how Bill taught me to play. It's always interesting to me...no matter how much I play my newer instruments, I just feel so much more relaxed with my weird "Robinson" tuning and floppy hammers. I used two pencil condenser mics placed near the lower right and upper left regions of the dulcimer. There aren't any overdubs, but I recorded the dulcimer part first with a click-track. Then I recorded Skip on upright bass, and finished by recording him on guitar. While I have permission to do whatever I want with my cut, the CD isn't yet available to the public. Check out Company of Folk's website to see more about what they do, and for updates on when the entire CD will be available. 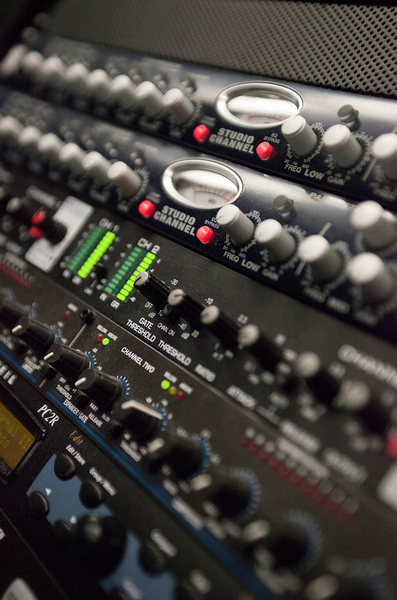 In the Spring of 2013, I decided I wanted to learn a bit more about audio recording. Being very limited on time, I inquired about taking applied Studio Recording (private lessons) at Waubonsee, which is right next to my house. One semester of study allowed me access to the recording studio at the college whenever I could reserve the room, and private lessons equipped me with a few of the basics. In the end, I am glad I made time to fit this project into my schedule. I don't see a career of sound engineering in my future, but the parallels between that job, and my current career really inspired me to improve in other areas of my profession. Of course, I took the opportunity, while in the studio, to take some photographs of the super neat-o equipment and gear! I've been told that the hammered dulcimer is a really tough instrument to record...my own endeavors would indicate this as well. It may be that I am extra critical of my own playing, but I didn't come up with any dulcimer tracks worth sharing here. I did, however, record this cute piece on 'ukulele with my friend Skip Sittig! I have a new respect for people who can sing with flawless pitch. I don't have a "singers" voice...but I've always thought I could carry a tune all right. I was surprised at how hard it was to not sound really really bad. I did the vocals and played the 'ukulele. Skip played guitar and upright bass. Last December I participated in a concert series with The Spirito Singers of Elmhurst, IL. it was a series of three pieces arranged by Cary Ratcliff. Each year they professionally record the concert series and produce an album of holiday music. What a pleasure it was to play with these incredibly disciplined girls! The music selections were whimsical and well keeping within the spirit of the season. I finally received a copy of the CD, all selections can be heard on my Listen page. Here's a recording of my favorite selection from Sunday's concert.